What kind of panel should I choose? "The coldroom that lasts in time"
Undoubtedly the most suitable cladding for aggressive environments, it prevents the problem of rusting being a plastic material. Frigor Box has been a leader in the production of coldrooms for over 40 years, and its fibreglass cladding is produced according to a special formula that makes it unique. Thanks to modern construction technologies and to its special formula, a uniform manufacture is guaranteed on all its surface/thickness. 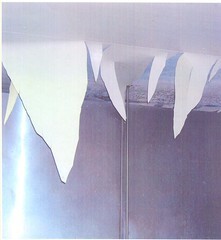 In coldrooms and industrial cold storage premises, integrity in time is guaranteed, even if subject to bumps and scratches. On the market you will find fibreglass cladding with a white surface layer (named GELCOAT), and the rest greyish. 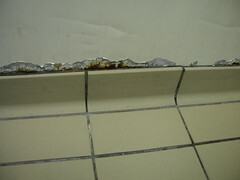 The normal wear-and-tear caused by high-speed moving forklifts and "careless" production personnel favours the formation of dents and scratches that immediately make your factory "older". Whereas, the Frigor Box fibreglass has a uniform white colour even in the deepest layers, thanks to its formula specially developed in its laboratories, thus always leaving your wall "clean". In spite of higher production costs, Frigor Box has noticed better results in time both on the aesthetical and in the structural point of view. Our distinguishing feature is just the possibility of having the side edging on the cladding, so the junctions result to be even more precise and clean. Claddings without edging make the use of suitable PVC profiles necessary for the correct panel connection. Quality is not only aesthetics. Thanks to the elasticity of fibreglass panels, even the problem of accidental bumps is solved. In fact, by simple small sand-papering and restoring operations, the wall becomes as good as new. 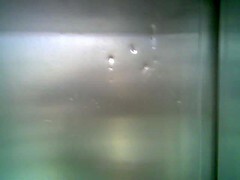 This is impossible with stainless steel, which fills with bumps and dents. FIBREGLASS solves these problems, that make you lose time with health authorities and veterinaries, besides jeopardizing the sanitary qualities of your premises. Our fibreglass is suitable for the contact with foodstuffs. As per certificate issued by independent university laboratories and witnessing the global migraton tests. Frigor-Box has been producing FIBREGLASS in its own factories with unique and efficient equipments for 40 years. 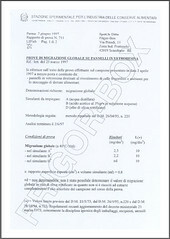 Thanks to the collaboration with advanced laboratories (Great Lakes - Lectt - Bayer - Marte - Vetrotex - Garzanti Chimica and more) the Research & Development Department of Frigor-Box has obtained a foodsafe FIBREGLASS that is particularly suitable for cold stores, with self-extinguishing grade Class 2 of the standard product, and Class 1 on request. The use of gelcoat in large quantities (minimum 500 g/m2), made up of isophtalic resins with (anti-U.V.A.) light-proofing components, makes it possible to obtain lightfastness in time and resistance to high chemical corrosion, more and more present nowadays in industrial plants. - Suitable for the food industry - CERTIFIED for the contact with foodstuffs!!!!!! The rough part in contact with polyurethane ensures a higher chemical - mechanical adhesion than 1,8 Kg/cm2. The plates are produced both with smooth and micro-ribbed finish, and both versions ensure cleanliness and hygiene.